The physical adventures, the physical hazards, which alone would make it an exciting book, are nothing compared to the moral and spiritual struggles which he tells about. He is always truthful and revealing, and the more he strips himself the more he finds himself in harmony with his fellow man. Quest, by George Dibbern, is his compelling account of breaking free from the constraints of society and from the impending scourge of Nazism. It was first published in 1941, in New York by W.W. Norton and in London by John Lane The Bodley Head. Having been at sea as a young man, having jumped ship in Australia and spent part of WWI interned in NZ after which he was deported to the country of his birth, restless and outspoken, he was unable to settle into life in post-war Germany. 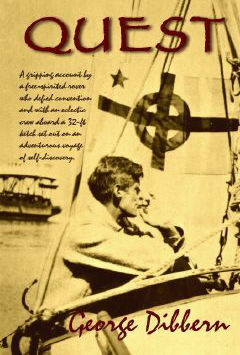 Believing his conscience to be a harsher judge of his actions than any god or court of law, he left his wife and three young daughters in Germany in 1930 and, aboard his 32-foot ketch Te Rapunga, with a baroness and a student of agriculture as crew, set sail for New Zealand. There— he was convinced of it—the Maori friends of his youth would surely help him acquire land which would then provide the means for his family to join him. The adventurous four-year voyage took him through raging storms, through halcyon days of longed-for freedom—tarnished with feelings of guilt at having left his family behind. Yet, convinced that “man does not live by bread alone” and that life is meant to be more than a desperate scramble for survival (as it had been in Germany), he persevered. Five years later, in New Zealand, he was faced with the fact that his family, having created a life of their own in Germany, would not join him in the new world. He recognized he had outgrown nationhood, and he committed to his life’s mission: with Te Rapunga flying a flag representing his ideals, he would be a bridge of friendship, goodwill, and understanding. 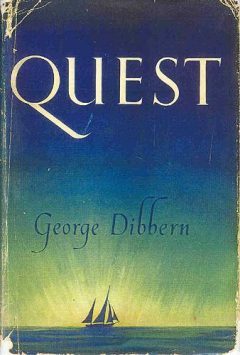 Told with insight and humour, Quest won the admiration of American author Henry Miller, who in 1945 wrote to Dibbern “as a brother.” Like Miller, Dibbern was a man ahead of his time—and Quest continues to inspire.